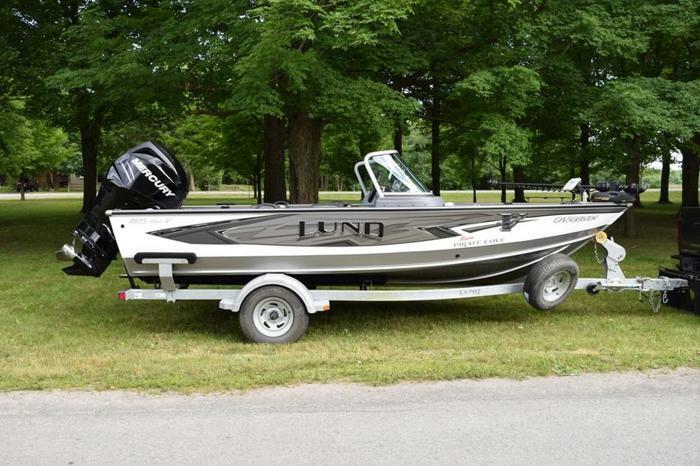 This boat was run by Lund Pro Staffer Dennis MacNaughtan for the season. It was ordered in fully loaded and is in absolutely perfect condition. It is a walleye catching machine! Loaded with features, it is powered by a Mercury 200 Verado with Smartcraft gauges and a Stainless prop. Also factory rigged with a tiller steered Mercury 9.9 Pro Kicker with power tilt. Top of the line electronics include a 36 volt 112 lb thrust Minnkota Ulterra with I-Pilot, a bow mounted Lowrance HDS 9 Gen 3 Touch and a Lowrance HDS 9 Gen 3 Touch mounted at the console. Both graphs are connected together with an Ethernet cable and include the Structure Scan feature. Cisco mounts are used for the graphs and the trolling motor is on a quick release plate. There is a 4 bank Pro Charger, Air ride seat pedestals,, rod holders, Stereo, Wash down system, and a Travel cover. Flooring is full vinyl and it is on a galvanized trailer with spare tire, brakes, swing tongue, and load guides. This is an incredible boat worth taking a look at.